Question 3. Construct a treatise, as if written by a German Cardinal, demonstrating that, although Genocide is not, strictly speaking, acceptable in the current state of the Magisterium, it could nevertheless (given its abiding popularity in both the developed and developing worlds) be tolerated. Question 4. Construct a treatise, as if written by an Anglo-Irish Cardinal, demonstrating that, although Genocide is not in accordance with the current state of the Magisterium, application of the principles elucidated by Newman in his Essay on Development might, in the future, make it doctrinally acceptable. Question 6. "The excommunications incurred by the SSPX bishops were remitted by Benedict XVI, but they are still excommunicated schismatics". How, as a pastor, would you explain this fruitful and elegant paradox to a layperson without a doctorate in Canon Law? Afterword for non-native English speakers: the above contains passages of what in this strange country, so unlike any other, we call "Irony". This means that (for example) the section headed Preamble is entirely fantasy. I wish it were all literally true ... I suspect, in fact, that the foundations of Archbishop's House are not high enough above the Thames water-table for there to be any safe cellarage. I doubt whether Cardinal Nichols has Butlers and Footmen (although I think Cardinal Wiseman might have had one or two) ... and any port laid down by Bishop Challoner (for whose Beatification I say the traditional prayers after offering Mass, from his own Missal, at Milton Manor where he stayed) would have faded quite away at least a century and a half ago. But it's all a lovely thought. How do you comfort yourself in your own country? I reproduce below in ordinary type a piece which I had written and which was scheduled to appear on March 8 (if you felt energetic you could look back and see what, at the last minute, I substituted). I relegated this text to 'Drafts' because, at exactly that time, somebody told me about some words of Cardinal Mueller to the Ordinaries of the Ordinariates about Ordinariate bloggers. There are intellectually slipshod people around who do not in fact read blogs but simply love getting enormously over-excited about what a blogger hasn't actually said. I thought there was a real risk that such good folk might claim I was commenting on Mueller's statement. And we live in a world in which we are even apparently in some way held responsible if we utter something which others, even deliberately, 'misunderstand' and distort ... as our beloved Holy Father Pope Benedict XVI discovered on more than one occasion. Furthermore, you will see that I was not commenting about people (like the Cardinal) who speak publicly, clearly, and on the record; but about a species of anonymous censorship. For the same reason, nobody (except people who make trouble by deliberate falsification) could suggest that I was writing about the Bishop of Lancaster, who has been open and on-the-record about his conduct with regard to one of his own canonical subjects. I share it with you now because of a considerable apprehension I feel, that there is abroad a spirit of suppression, of which I disapprove, of the expression of certain viewpoints. I hope I am wrong. I doubt whether there is any truth in the rumour, which I've heard from more than one source, that the Franciscans of the Immaculate are being done over because they published, in Italian and English, a book by Mgr Brunero Gherardini called Concilio Ecumenico Vaticano II: Un discorso da fare; Anglice autem The Ecumenical Vatican Council II: A much needed discussion. I doubt it, because it would seem like using a sledge-hammer to crack a nut. If it were true, that would surely be most unfortunate. After all, we live in an age in which dissident minorities repeatedly ask for dialogue ... beg that "their story be heard" ... and there seem to be prelates who turn to them an ear which is less than deaf. But few Management ears seem to compete to hear voices which, after fifty years, seek to set that Council within a new theologico-historical context. This appears to be one sin, one dissidence, too far. And, to this toxic mixture, the name 'Lefebvre' can only add a yet deeper degree of toxicity. I have no objection to censorship, if it is done within a settled legal framework; that is, by a qualified Censor librorum who, if he withholds a Nihil obstat, gives and is required to give precise reasons for doing so. I would have no criticism if the system were not only restored, but extended to the blogosphere, and, of course, to clerics and laics who write columns and editorials in 'catholic' journals! But it has fallen into disuse. My apprehension is that a public and canonical process might have been replaced by something furtive; that a bishop (or whatever) might act resentfully but covertly because of views which are doctrinally orthodox but which don't suit his personal agenda. Or that censorship might function as an informal, unminuted, understanding within an Inner Circle that X is 'off-message'; with subsequent disadvantages for X. In other words, I fear that what, at first sight, looks like a libertarian advance (the disappearance of formal Censorship), might in reality be simply a Bullies' Charter. As I have written before, I regard Dogma and Law as the safeguard of ordinary Catholics, both lay and clerical, against Arbitrary Power. What is all this really about? I was sent, about a month ago, as 'for review', a copy of a book which is by no means new or unreviewed; They have uncrowned him by Archbishop Lefebvre. When I have read it (I have never seen it before) I intend to pen some comments about it, from the point of view of one who subscribes entirely to the Magisterium of the Church and who accepts Vatican II as lawfully convoked and lawfully confirmed and as deserving the obsequium religiosum properly due to an ecumenical Council, utpote quod defined no dogmas and uttered no anathemas. Throughout most of the twentieth century, Catholic theological expositors of Eucharistic Dogma were concerned to deny that the Church's teaching, as expounded by Trent and subsequently, did in fact fall into one quite horrible late Medieval error. Be you a Masure or a Vonier, you constructed your theology of the Sacrifice so as to be able to plead Not Guilty to a charge that you regarded it as a New Sacrifice; that you believed in a Christ who was sacrificed anew, slaughtered upon the Altar, each day. Because ... we have to admit it ... that is what those benighted Medievals did believe. Or did they? There have long been Catholic writers who have in fact questioned whether the medievals really did fall into that terrible error. As a matter of History, so they argue, this error was never prevalent. It is part of a Protestant determination to produce an alibi for the hysteria towards the Most August Sacrament of the Altar ... with all the concomitant vandalism and murder ... which the 'Reformers' encouraged. 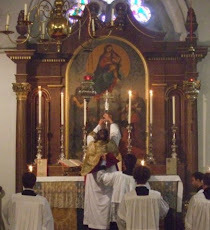 What not many people tend to notice is that, according to the Rite of Sarum, when, at the Offertory, the celebrant offered (together) the charged chalice and paten, he said a prayer which began Suscipe sancta Trinitas ... and ended In nomine Patris et Filii et Spiritus Sancti, acceptum sit omnipotenti Deo hoc sacrificium novum. [God is asked to accept "this new Sacrifice"]. So, it seems, the Medievals were guilty. Or were they? The 'reformers', as they harried Catholic priests to their deaths, sometimes advanced the entertaining ad hominem argument that they were self-condemned, since they actually claimed that they slaughtered Christ! ("Worse than the Jews, who only killed him once!") There are undoubtedly easy ways of avoiding this convenient conclusion. The Sacrifice of Christ upon Calvary, perpetually pleaded on high before the Throne of Grace and present mystikos upon our altars, is a new sacrifice in as far as it replaced and replaces (supersession) what some of the old secrets call the differentias hostiarum, the complex of different sacrifices prescribed by and under the Torah. Calvary ... and the Eucharist ... conjointly, in that sense, are a new Sacrifice in as far as they are the Sacrifice Novi et Aeterni Testamenti. I most certainly intend to conclude this piece with a second half beginning "However". 1. UKRAINE. Professor Tighe has drawn attention to two good pieces, under Spengler and Eric Posner, on the Ukraine Business. My own view is that this is a matter on which the Roman Pontiff ought to be in the public forum. The Church was into the subjects of Just War and International Law long before the modern secular Nation State had been invented. Let's have some substantial Magisterium on all this, Holy Father! S John Paul II was very definite during the Gulf Wars! 2. FR RAY. Another very good one. Why can't I produce stuff with such good sense ... and so fluently? 3. BLOGGING ETC.. A fine letter from Bishop Egan on the ethics of the use of these modern media of communication, with real and sensible warnings for all of us. Worth reading three times ... One columnist has suggested that there's hardly a member of the English hierarchy who doesn't have it in for "clerical bloggers". I don't have the faintest idea whether that's true (how could I possibly have? ), but if, sadly, it were to be true, Bishop Egan would certainly, by this, have put clear blue water between himself and a number of his brethren. There's all the difference in the world between giving such sound pastoral advice to everybody ... whether episcopal, presbyteral, diaconal, or lay ... and (creating at least an appearance of) being a Management Caste anxious to repress legitimate comment among (what the aristocratic Whig Anglican bishops of the eighteenth century used disdainfully to call) the Inferior Clergy. 4. HELL. Good to know that the Sovereign Pontiff has just reaffirmed the existence of Hell. But won't this make him unpopular among the liberals? I foresee a scenario in which the Guardian (and the Tablet?) will be condemning the Papacy simultaneously for (1) not condemning the Mafia loudly enough in the past, and (2) telling them now that they risk going to Hell. In the very lengthy sequence which accompanies this Mass in Sarum, there is one stanza in which there are textual problems. Here is the 'common' version, viz that in most of the printed editions. pedes plantae etiam ferro concavantur. There are no problems in the first line. Nor in the third line. In the forth line, two (of the very many) editions, 55p and 34, read pedum plantae, more elegantly. It could be original or it could be a deft improvement. Two 97 and 98, read conclavantur, a repetition of the ending of the first line, and therefore improbable. But this reading surely witnesses to concavantur. 55p and 34 have terebrantur; perhaps somebody had conclavantur in front of him, realised it could not be right, and (elegantly) guessed at terebrantur. The second line is the problem. We need a plural subject or a plurality of subjects. 97, 98, 55p, and 34 achieve a plural subject by correcting the strange caro to membra. 55p and 34 read trucibus for cruribus. This seems to me a brilliant emendation (if is not original). c and t are nearly indistinguishable in medieval orthography. 97 and 98 substitute corporis for cruci, but thereby secure a line which is a syllable too long. nice, but I can't see how the common version's tractabantur arose from alligantur. And I always think the best accounts of a crux are those which account for the corruption. I thought I might use this occasional heading for occasional brief notes on Matters of the Day; particularly when it's just a matter of saying that X or Y has put something ten times better than I could have done. 1. Bishops A quite wonderful letter to the Tablet by Bishop Drainey, who very wisely decided to write while he was still feeling angry at the way that periodical just bins the monthly newsletter he goes to the trouble to send them, and then insults his people by sensationalising their responses to the coming Synod. Nice, fierce, words about the Tablet and its own 'agenda'. 2. More Bishops A good brush-off by the Bishops collectively to an unreflective campaigning group which wanted them to dump the new Translation of the Missal. This is no trivial matter: the old translation effectively cut the plebs sancta Dei off from their rightful liturgical inheritance by making no attempt to give them, in English, the riches of the original. The new Translation reconnects ruptures and prioritises continuity. 3. Presbyters and Deacons A fine piece by Fr Ray about relationships between a Bishop and his clergy. One of the best examples of what Father advocates was the praxis of Eric Kemp, long-time Bishop of Chichester. It also reflects the style of episcopacy we got used to in the C of E when we had the Flying Bishops. 4. Canonisation Very interesting piece by Sandro Magister about Canonisations. Devoted and really keen readers of my blog will be reminded by it of the pieces I published earlier this year. I remain convinced that what Benedict XIV wrote still applies; that until the Holy See decides otherwise, we are not bound to give canonisations the absolute assent de fide which it is commonly suggested they demand. 5. MPs Man to watch: Sir Edward Leigh, Conservative, a Catholic. A rare and interesting voice who doesn't just go along with the facile unreflective consensus. He actually ventured to suggest that we should try to understand the Russky viewpoint! Horror of horrors!! The Paschal Alleluia in the late medieval Mass of the Five Wounds exhibits lectiones varias. Ave rex noster Jesu Christe tu solus nostros errores et reatus miseratus pertulisti Patri obediens ductus es ad crucem ut agnus mansuetus ad occisionem tibi gloria osanna tibi summe laudis et honestatis chorea. Notes: this has a characteristically medieval set of rhymes or near rhymes: of which more later. Chorea is an odd word. Ave rex noster tu solus nostros es miseratus errores Patri obediens ductus es ad crucifigendum ut agnus mansuetus ad occisionem tibi gloria hosanna tibi triumphus et victoria tibi summae laudis et honoris corona. Notes: corona is interesting. Written choroa with a tilde for the n over the second o, it would easily be corrupted to chorea. The tibis at the end could lend themselves to parablepsis on account of homoeoteleuton/ homoeoarchon (or, in George Kilpatrick's shorthand, just 'hom'). tibi summae laudis et honoris corona. Rhyming Christe with Pertulisti: would that suggest an English provenance? The question is, surely: do we have a florid medieval composition toned down by the Pian Counter-Reformation, or an originally simple composition made more florid in Sarum? May the exigencies of melody have played any part in this? This would imply a degree of ms transmission to allow for the two corruptions. So ...??????????? Fr Tim Finigan has written with such wisdom and concision that I feel there is nothing to add, except perhaps this. Clerical bloggers do a vast amount of self-censorship, largely so as to protect the reputation of the Church, and not least of the Bishops, in this country. They even refrain from writing about matters in which they have been painfully and personally involved, so as not to damage further the Church's image. They suppress information which is sent to them. And they find themselves trying to calm people down and to reassure the troubled. To be presented, as a result of these efforts, with the news that one is a Problem; that one is to be treated like a Naughty Little Boy who needs to be Carefully Watched and Strictly Disciplined, leaves a distinctly unpleasant taste in the mouth. Anthony Neil Wedgwood Benn, 2nd Viscount Stansgate, Westminster and New College, died this morning. He was fiercely proud of his family and intellectual roots in the English radical dissenting Protestant tradition; I do not know the state of his soul when he died, but I pray that he may find mercy. Sadly, like so many on the Left, he came to assume the murderous logic of extending 'rights' to the choices of women who did not wish to bear their unborn children ... how easily the Evil One, and with what skill, can pervert what is good to his own ends. But I will still think of Wedgie for his long-time service to some of the most deeply moral causes in British politics during my own lifetime. Like another politician, one on quite the opposite political extreme, Enoch Powell, he came to see the wrongness of the 'Nuclear Deterrence' policy, which is a monstrous evil still with us. How admirable it would be if this Sovereign Pontiff were to take up that moral issue with the theological seriousness of the Traditionalist Moral Theology, based on the Church's teaching about the conditions for a Just War, espoused by Germain Grisez and his collaborators. And, like Powell (whose speech after the British colonial Hola massacre in Kenya is one of the all-time classics of English Oratory), he was an early critic of colonial racist cruelty. He opposed NATO ... another abidingly toxic problem today, as Western Interests, forgetful that Russia has reasons, based upon centuries of experience, for fearing expansionism from the West, do their best to edge the boundaries of NATO ever closer to Moskow, indifferent to the instabilities which this policy involves. Here again are problems which, please God, this Pontificate may at last have the courage to address; and the sooner, the better. And Wedgie was an opponent of the policy of successive British Governments of traipsing round the World on the coat-tails of various invariably disastrous American military adventures. Wedgie lost every significant political battle that he ever fought. But, as we listen to each News Bulletin on our wirelesses, who dares say that his victorious enemies were right? Let me be frank. It costs 2,000 Euro or so. And it takes up June 30 until July 11 of your life. Twelve days taken out of your three-score years and ten! But nearly a fortnight in the North Italian Lakes in early summer? And the Vetus Ordo on offer daily? And two top-quality lectures a day? And fine food? Cocktails and lake trips and excursions? Something ... well, something to do? Or, if you can't come, but want to do some good, could you provide a bursary for a priest or a seminarian to enjoy the experience? Oops ... I should have declared a personal interest: I shall be there myself; I shall giving Conferences (Deo volente). But there are plenty of bars around if you want to skip the Fr H bits. This is the 22nd Roman Forum Summer Symposium; this year it is about what has happened to Catholicism in the last hundred years. Which is ...yup, you think about it ... quite a lot? Yes? It is co-ordinated by an American academic, Dr John Rao, who spoke memorably at a recent LMS conference in England. Join him or help him? Please? I don't think I have often seen nastier pictures than those of Press photographers clustering round the relatives of those on the lost airliner in order to get good pictures. A month or so ago, I was sent some books 'for review' - not new ones, but quite old works. Tomorrow, I shall embark upon They have uncrowned Him, by Archbishop Lefebvre. We are clearly moving into a period of new appraisal of the Council, and many of us have read our own Dr Aidan Nichols' book, gently and elegantly dialoguing with an adherent of the SSPX; and that of Mgr Gherardini, a Canon of S Peter's in Rome with a distinguished academic record. It seems to me appropriate to see how Mgr Lefebvre's book has stood the test of the years ... the quarter of a century since it was written. As you would expect, I shall approach it quite unambiguously from the point of view of one who accepts ex animo that Vatican II was lawfully convoked and its texts lawfully confirmed; and that it is deserving of the obsequium religiosum due to a Holy Ecumenical Council of the Universal Church, utpote quod defined no new dogmas and uttered no anathemas. And one who accepts, with the appropriate levels of adherence, the Magisterium of the post-Conciliar Church. In accordance with Revised Blog Policy which I announced yesterday, if I find it necessary to disagree with the Archbishop, I shall do so temperately and very gently, determined neither to be divisive nor to upset those who still view the Archbishop with great reverence. In particular, nothing that I write should be deemed to imply any criticism of the SSPX. As you know, I have, since reviving this blog, declined to enable comments which abuse the Holy Father or the members of the English hierarchy, either individually or collectively. This will continue to be so. But, additionally, I shall not enable comments which seem to me in the least divisive; divisive vis-a-vis other Catholics; divisive vis-a-vis non-Catholics; or in the teensy weensiest bit uncharitable. This will be the blog that never upsets anyone! My decision results from the words of Cardinal Mueller about Ordinariate blogs; it is, I think, an immensely reasonable request on his part that, having taken advantage of Pope Benedict's generous offer of Full Communion with the See of Peter, we should not import into the Catholic Church the cheerful mud-slinging habits of our Anglican Patrimony. So you all need to become sensitive and unaggressive, like proper Catholic bloggers. I shall, myself, follow the same policy: I think the only possibly upsetting posts I have published recently were one which criticised 'ultra-ultra-traddies' of a sedevacantist disposition who do not believe that Novus Ordo Sacraments and Orders are valid; and another which took apart the Brentwood liturgist who wrote around telling the clergy that it was perfectly OK to use the old, now superseded, ICEL translation of the Missal if they didn't like the new one. I expect these people are all very sensitive types, and if, hitherto, they have sobbed into their unresponsive pillows in the lonely watches of the night because of what I wrote, I'll spare them that in future! So - readers - please do not put me to the embarrassing unpleasantness of having to censor you! If your contribution fails to pop up, it will be because I deem it upsetting or divisive! I have not been in touch with this college since it moved out of the hands of its founders and changed its site and its name; and I have no first hand knowledge of the reasons behind the events of the last few days. I can only recall an extremely happy visit to St Thomas More College a few years ago, in company with a great friend of the College, Fr Allan Hawkins, then Rector of the Anglican Use parish of St Mary the Virgin in Arlington. It felt like a little piece of Oxbridge in Texas ... two people in MA gowns chatting in the car-park ... lunch with the Chancellor Dr James Patrick ... a young man sitting on my other side with whom I had a most civilised discussion about the ode of Horace he and his fellows had been studying that morning ... time with the Classics don, Mr Harry Lacey (a Yale man, if I remember rightly, and a fine Classicist) and other members of the Senior and Junior Common Rooms. I hope and pray that something may be salvaged from an unhappy situation. I do not find it in the least easy to understand why, whatever may have gone wrong, a Bishop should pick upon the Vetus Ordo as the root of a malaise, or how banning that will remedy whatever it is he judges to be amiss; but I am not going to pontificate about circumstances with regard to which I am imperfectly informed. I am simply going to pray for those who have been unjustly hurt or damaged, and I urge readers, of their charity, to do the same. A splendid video of Ash Wednesday Mass at the Atonement Academy in San Antonio, Texas. It must be just about the most remarkable success story of Anglicanism in Full Communion with Peter: Fr Phillips' large church, huge congregations and vast academy ... oversubscribed ... I've only watched the first ten minutes so far, but how it brought back happy memories of days spent there in the summer of 2011; the sound of that marvellous thurible with the bells making its way up the church ... Don't fail to notice the instinctive and natural piety of the young people; we were never so successful in inculcating that at Lancing ... the natural arrogance, do you think, of the English middle classes? What is it about Texas that makes it such natural soil for transplanting - and giving a new Catholic vigour to - Anglicanism? Viva the Lone Star State! If only poor Dr Cranmer, as they hustled him up the Turl towards the city ditch and the waiting stake, could have known where his liturgical compositions would end up! I ran, yesterday afternoon, into Henry Bradshaw and one or two other friends, knowledgeable chaps, and thought I'd see if they knew anything about the dates of the entry of the Mass of the Five Wounds into medieval Missals. Apparently the Hereford Missal, which achieved a printed edition in 1502, lacked this Mass. But there is a manuscript version which has it copied in by a later hand at the end, together with the Sarum introduction about Pope Boniface. And, as in Sarum, it is associated with that other exemplar of late medieval Christological affection, the Mass of the Holy Name. York was more interesting - my chum Surtees came up with the facts. It has the Mass of the Five Wounds in editions printed in 1509, 1516, 1517, 1530, 1533. However, it is not in the (earlier) manuscript versions of the Missal except ... get this ... that there's a nice ms at Stonyhurst, which Surtees says is from the second half of the fifteenth century, which has it written ... but left unfinished ... on an outside folio. So, in a very crude, prima facie sort of way, one might tentatively wonder if de Passione Domini is a chopped down version of the Mass of the Five Wounds, rather than the original from which it is developed..
Can anyone fill in some prehistory here? I am beginning to wonder if the Mass of the Five Wounds (and its putative spin-off de Passione Domini) is even later than I had guessed. BTW, another learned friend - not Bradshaw or Surtees - says that the Mass of the Five Wounds is not in the Nidaros Missal, which would strengthen the point made on an earlier thread by 'Ben': that physical evidence of the cult of the Five Wounds in Kirkwall Cathedral inclines one to guess that Sarum had, by the end of the Middle Ages, replaced Nidaros in the Orkneys. I am not very interested in what the Holy Father meant a few weeks ago when, according to the official English version of his words, he called upon women to be more "capillary". (If I were to offer a hypothesis, it would be that he is opposed to Lesbian hairstyles, just like the Canadian Moslem hairdresser in yesterday's news.) No: the historical aspects of this event, unusually, interest me more than the linguistic. There seem to me two main possible alternative explanations. Either (1) that the Spanish Desk in the Vatican Press Office is staffed exclusively by gentlemanly and ladylike Spaniards. They are so Princely and Renaissance that they have no knowledge whatsoever about the current urban slang in the slums of Latin America. So they give a literal, dictionary, equivalent of the Pontiff's more impenetrable idioms. This is understandable. After all, if a typical ordinary Englishman were to be snatched Sinbad-like from the streets of Oxford ... as it might be, me, for example ... and, with no philological preparation, were to be dumped into one of New York's more vividly diverse suburbs, it might be some time before I got the syntactical structure, the intonations, and the vocabulary of the dominant patois entirely straight. Or (2) that there are some jokers at the Spanish Desk determined to make Pope Francis look as ridiculous as possible. They are probably the same nasty evil miscreants who let loose the cruel black crow that ate up the beautiful white dove that the sweet little children standing beside the friendly lovable Pontiff had just released. These humorists are having a field day subverting the pope's persona, his carefully crafted public relations image. If that is what is happening, it is the first scandal, or Francisgate I, of this Pontificate. But whichever of these is the truth, Francis should do something about it. He should put on hold his grand scheme to Reform The Curia ... after all, pretty well every new pope Postpones the Reform of the Curia about eleven months after his election, so it would be pretty well what everybody is expecting. Then he should spend his every waking hour getting a grip on his Press Office. On the McAdder Management Principle (vide Decline and Fall: "Give hell to the man immediately below you, and you can rely on him to pass it on with interest") he should have Fr Lombardi given an hour or two of Enhanced Interrogation (Yes!!! we 'Old Europeans' have so much to learn from our American Cousins!!! ), daily, until everything was sorted out. Actually, this is in any case probably the best method of solving the Problem of the Curia. Historians assure us that it is very much the way in which Urban VI, Papa Prignano, Reformed the Curia in his day. Those of Francis' cardinals who survived Sant'Angelo would probably flee to Avignon, annul the last Conclave, and elect Cardinal Burke as Leo XIV. It could all happen in time for a newly independent Scotland, and Merry England, to be under two different 'popes', just as they were in the Good Old Days, the fourteenth century, the Age of Faith! And then Tally Ho for the 'Spirit' of Pisa II and the 'Post-Conciliar Magisterium' of Constance II!! "Blessed GK"? Santo subito! Chesterton MATTERS!! There is to be a day conference on Chesterton, including input from the Chairman of the American Chesterton Association, and containing information about the state of the cause for GK's Beatification. and urge those who can make it, and thus support this very important cause, to do their best to go along. To be found anywhere on the internet?